Unique and very elegant design. Special template is included. Unfinished. 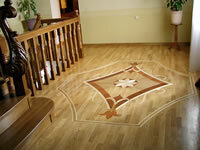 Wood Medallions can be prefinished for an additional 10% charge. Standard finish is high quality water based polyurethane, semi-gloss. Wood top layer is glued on plywood backer. Larger, over 60" medallions are not glued but supplied separately as face-taped wood layer and plywood backer to be glued on-site. Standard thickness is 3/4". 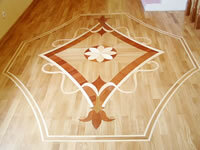 You may request custom thickness for inlay from 5/16" to 3/4". 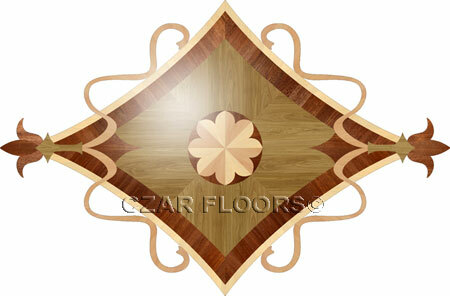 Up to 60" in size wood floor medallion can be made as a single piece. Larger inlays supplied in precisely fit segments. Review Wood Medallions Installation Instruction. FREE ROUTER BIT, TEMPLATE IS INCLUDED WITH EVERY WOOD FLOOR MEDALLION. 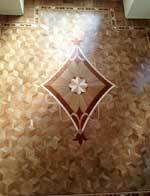 Adhesive Recommendations:For medallions and borders installation Czar Floors recommends Bostik © Best glue. A fast curing, one-part, cartridge/gun applied, moisture cure urethane adhesive that does not contain water or chlorinated solvents, is V.O.C. Compliant and has no ozone depleting chemicals. The glue is available from Czar Floors. You may add the glue to your order or purchase separately online. A pair of latex gloves to work with adhesive is already included with every item. All standard products are unfinished. Additional installation and maintenance supply can be purchased on-line. What is the size of the medallion?